For a supposed grief expert, I sure forget the basics sometimes. I find myself crying at odd times over odd things and get surprised by it. Then it finally occurred to me that it has only been two and a half weeks since Dad died. I preach to everyone that grief takes a long, long time. I’m not even close to being finished! Continuing to cooperate with investigations about the fiasco that surrounded his death certainly keeps everything fresh. And it ignites the anger all over again too. I don’t mind spending the literal hours upon hours to do this. But am I going to feel that way if at the end of it all nothing happens? What if nothing changes? I’ve said it before and I will say it again. I keep learning new things and witnessing situations where I realize that the level of dysfunction in our medical system goes deeper and deeper. Will it ever get better? Is it even moving in the right direction? And will someone like me even able to make the tiniest difference? I love the picture I posted last week. Dad looks genuinely happy to have his daughters with him. It is freaky weird to think that was only two months prior to losing him. He looks healthy and full of life. The first thing that set me off was a form letter I received. I talk about this event ad nauseam every day. Seeing “we have been informed of the death of David Thiel” is pretty straight forward but it knocked me off my feet. I just started crying. Colin made me feel better. He saw it and said that it is indeed difficult to see it in print. Thanks to the countless number of you that have sent cards, donations, food, flowers, and just plain old check in calls. So many people knew him and think he was a stand-up guy, just like we do. There is a big empty hole in my gut that is going to be there for some time. Not sure what will start to heal it, but I know time is a factor. An eerie number of my friends have lost a parent this year. If you are one of them, give yourself a moment to be gentle with your memories. If you know someone who is going through this, take a moment to reach out or say a prayer. It means more than you know. Yep, that’s me and my daddy. Categories: Grief & Loss, Uncategorized | Tags: grief, grief and loss, loss, loss of a parent, medical system | Permalink. I’ve been staring at my screen for a while now. I’m trying to think of something creative or clever. Funny is my favorite. I know this blog was started around grief and loss, but I try to mix it up. But alas, it has been more of the same. The universe hasn’t shifted much this week. People are still being born. People are still dying. No one has learned to live forever. It’s the usual cycle of life and death. Yet, I know for those folks that have been touched personally, their lives are anything but usual. Their worlds have been turned upside down. They are either slowed in a fog or frantically keeping busy every moment of the day handling “stuff” which also serves to shield them from the full impact of loss. My neighbor from where I grew up died recently, much too young. There was a benefit for her just days before her passing. A terminal illness battle. A dear friend lost her father. He was the same age as my dad, also a Korean vet. His story reminded me of my mom. Three fast, confusing weeks of illness with little or no answers and suddenly you have lost a parent. Devastating. My current neighbor lost her mom. I read her texts as things developed and my heart ached for her as she waited, unable to do anything but accept the inevitable outcome. This weekend my family will attend a memorial service for Mom’s twin, a woman who was at one time so very close to our hearts she was like a second mom. So the statistically normal thing will just keep happening. But I know that for many, many families, “normal” will be changed forever. My heart hurts for all of you and I offer my love and friendship if wanted or needed as you go through the painful days ahead. If you know someone enduring a loss, take the time to make a call, send a card, or offer a hug. It will mean more than you know. Categories: Grief & Loss, Uncategorized | Tags: death, funerals, grief, grief and loss, loss, loss of a parent, memorial services, terminal illness, wakes | Permalink. I’m quite sure it’s a normal part of the human experience. Now that I’m in my 50’s, I think things that I probably thought in my 40’s, maybe even younger. Why am I still dealing with this? Do you ever just stop worrying about certain things? Recently with adding job re-design and hunting to my life, I find myself in the place where I was a couple of years ago – exhausted. Most days I leave a lengthy list of things that I don’t get done that get cut and paste into tomorrow. I know I’ve been productive all day, there just is more to do. Lots more. Lately I haven’t been sleeping well either. Last night I was still awake at 3:45 am, knowing I had to wake Frankie at 5. I ended up skipping an important seminar in the morning and slept until 11. Then the most productive part of my day (usually) has been lost and the rest of the day is spent playing a hopeless game of catch-up. The only reason I’m blogging now is because I forgot to confirm an appointment so by the time I remembered we had to reschedule. Don’t misunderstand me. I am not looking for a pat on the back. I am just trying to be realistic here. Does anyone really care about blogs? Does anyone even have time for them? Most weeks I love writing because it helps me process life, but sometimes I stare at a blank screen and wonder if I should bother. Then I get something unexpected. This time, it was an email from an old friend several states away. I met her through my first husband, so you know that was quite a while ago. I don’t even remember the last time we spoke. Anyhow, she reached out to tell me she was hurting terribly. She has read both of my books and been following my blogs for years now. That has enabled her to keep up with the basic gist of my life. She has now lost both of her parents and gone through a divorce after 35+ years of marriage. Many of those losses were piggy backed cruelly on top of each other. My heart broke for her. I had no idea she even remembered who I was. I certainly didn’t know she had invested so much time into following my story. I was humbled and honored all at once. Again, it is not about the pat on the back. It is about the reminder that as we conduct our lives, we really have no idea whatsoever who is watching. We don’t know who we are impacting – for good or bad. Reminds me of the verses in the Bible where it talks about how we might entertain angels, not knowing we are doing so. Thank you my friend for being the life jacket I needed this week. You gave me purpose when I was feeling discouraged. If you are reading this, please know I look forward to talking soon. It will be my honor to walk through any part of your journey with you as you navigate the difficult waters of re-inventing yourself after tremendous loss. I love you! Categories: Grief & Loss, Uncategorized | Tags: blog, blogging, discouragement, divorce, grief, life jacket, loss, loss of a parent | Permalink. The day after Christmas, Matthew’s wife went into labor. 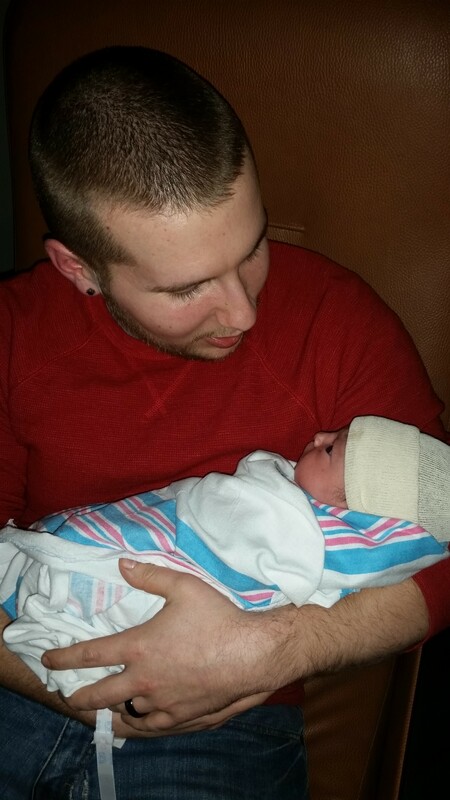 At eleven minutes after midnight, my beautiful granddaughter was born. I was honored to be there for it. I was reminded again that women’s bodies are AMAZING. A birth truly is nothing short of a miracle. Matthew and his wife, Sherry have a special bond. He had just starting dating her when he lost his dad. She had already lost her mom a few years earlier. He often talks about how Sherry has helped him navigate through his loss, being the veteran that she is. I don’t know Sherry or her family very well. But I did catch wind of the fact that the family believes when they find a dime, they know their mom is showing her presence with them. I have no idea how that got started, but I know they believe it with all their hearts. If you were to look through Matthew and Sherry’s wedding album, you will see a photo of a dime. When Sherry and the girls were at the wedding site getting dressed, a single dime was found on the floor. The photographer was made aware of the significance and took a picture. I thought it was a lovely story, but probably somewhere inside I was skeptical. A dime is kind of common, right? Although it is not so common to find one in a fancy dressing room. Anyhow, after the delivery of my beautiful granddaughter, Sherry’s sister and I decided it was time to go home. It was about 1:30 AM and we were tuckered out. Granted, Sherry did all the work but somehow we were also tired. We left together so we wouldn’t have to walk in the parking lot alone. After getting to the lobby floor, we started to walk toward the door. 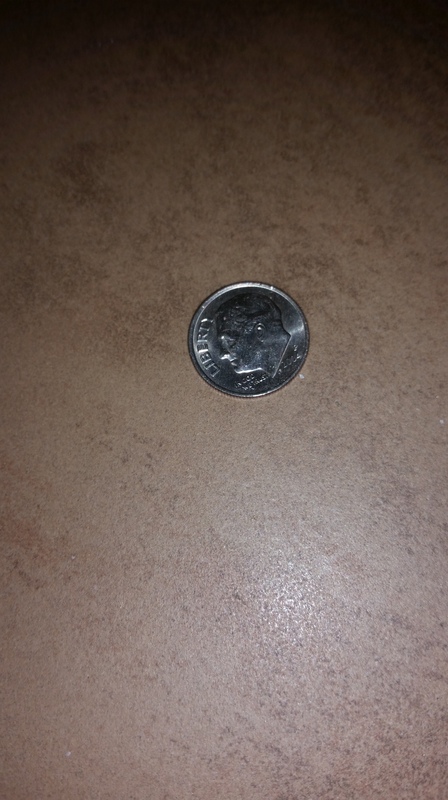 There on the floor, was one solitary dime. Shinier than any I have ever seen. Now I no longer even have a tiny ounce of skepticism. I had goose bumps from head to toe. We took a picture and texted Matthew. Her sister wanted to take the dime upstairs so we went back up. While she shared the special moment, I stood in the hall and told the nurses the story. I think they had goose bumps as well. One shiny dime. A gift greater than a million dollars. Categories: Grief & Loss, Misc., Parenting | Tags: birth, dime, granddaughter, loss of a parent, visits from heaven | Permalink.